The doomsday scenario of machines taking our work and destroying society as we know it is not new, but The Rise of the Robots cranks up the debate. Uber and Airbnb. Self-driving cars. Drones that can deliver everything from shopping to Hellfire missiles. You don't have to be a Silicon Valley veteran like Martin Ford to notice that tech seems to be eating everything else these days. 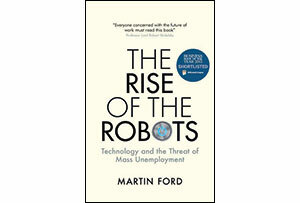 But even though we can all add our own favourite 21st-century examples to that list, the basic premise of The Rise of the Robots - that machines will destroy not only our jobs but also the established social order - is as old as the hills. It dates back at least 200 years, to the Luddites and Mary Shelley's Frankenstein, both responses to the same basic issue - the fear of unchecked technological progress. What Ford does well in this his second book on the subject, is take that deep-set historical techno fear, unpack it and play it back to us on the intellectual big screen, magnified and with plenty of hard-hitting stats thrown in to boost the special effects and make sure the volume is turned up to 11. The gist of his stark narrative is that we are on the cusp of a completely automated global economic era dominated by robots, where there won't be many crumbs of work left for us poor humans to pick up. It's happening already, he says, citing the 'Jobless recovery' since the crash of 2008 (especially in the US) and attributing it largely to better tech. The successful new businesses of the 21st century have been remarkable not only for the speed at which they have emerged, he notes, but also for the very modest number of people it has taken to build them. When Facebook bought Instagram for $1bn in 2012 it had 13 employees - $77m per employee. When it bought WhatsApp for $19bn in 2014, it had only 55, a whopping $345m per employee. Computers - and clever algorithms - do all the work. First burger chefs in Byron and Gourmet Burger Kitchen, next solidly professional jobs for the well educated - doctors, lawyers, even (surely not?) journalists. Neither white collar nor university degree will protect you this time. The mysterious forces of creative destruction, ensuring that superannuated old jobs are ultimately replaced by more and better paid new ones, have, claims Ford, gone into reverse. His end point is a dismal socio-economic event horizon, beyond which robots will have taken over so much productive capacity that most of the population will simply have become unnecessary. The majority will be left in penury, and the whole capitalist edifice will come crashing down for want of customers with money to spend. Crikey. Well, it might happen. Inequality of income distribution is certainly on the up. But if creative destruction really has stopped working since 2008, it's as likely to be a result of quantitative easing, ultra-low interest rates and zombie companies as it is the impact of the tech revolution, undeniable though that might be. And coming as it does in the wake of such an impressive mass of evidence, his solution is both economically and psychologically unconvincing: a guaranteed income of $10,000, paid to everyone. The value to the reader however is in the journey as much as the destination and here Ford is an admirable travelling companion. He provides a terrific layman's guide to a debate that is not going to go away any time soon. Any parent of children will come away with some pretty searching questions about the educational choices their kids will face over the next few years. In the end what I took from this book owed more to Mary Shelley than Ned Ludd: it's not so much the robots themselves we should be worried about, as the motives of those who own and create them. That is what will really define the future of humanity.